I never knew one could get so freakin' excited about granola. I bet you didn't either. Frankly, I bet you still don't. But you will, if you make this granola. Ever since I cooked from Alana Chernila's Homemade Pantry: 101 Foods You Can Stop Buying and Start Making for the From Scratch Club Book Club and took part in the Cook It! 2012 cooking challenge, I've been motivated to make my own versions of some favorite pantry staples. Crackers, Nutella, ranch dressing, chicken patties -- it's been surprising how easy they are to make, but not surprising how much better they all are than their processed counterparts. 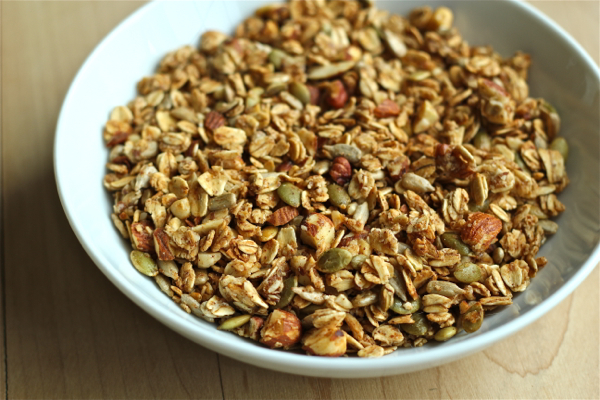 One basic I seemed to be overlooking was granola, a breakfast favorite around Chez Ninj. I think part of the reason was that everyone seems to make her own granola and everyone claims that hers is the best. So I decided to go with one from several sources that I trust. The winner? It's called "The Best Granola Recipe" by David Lebovitz, who, along with Molly from Orangette, adapted it from Nigella Lawson. Those are three pretty great endorsements, don't you think? The verdict? David doesn't lie. And Mr. Ninj says it's the best granola he's ever eaten. I love this granola because it offers not only all the good aspects you expect from granola -- nuttiness, crunchiness, good-for-you seeds and twigs (just kidding) -- but also a sweet, fruity flavor that doesn't come from tons of sugar and lumps of dried fruit (which can often get pretty darned tough in granola, I think). That's really the secret to its awesomeness: the yummy sweetness comes from a fruit puree, sweetened with honey and brown rice syrup. I could not believe how much I liked this granola. Enough to eat it plain by the handful and as a breakfast cereal with a little kefir, when I have never eaten granola on its own before. I raved about it on Facebook. To my friends. Who now probably think I'm whacked because I was so excitedly raving about granola. In fact, I haven't posted such an "OMG OMG OMG" status since the release of the Johnny Cash commemorative postage stamp -- but my love of Johnny Cash is a story for another day. I don't want to overwhelm you with awesomeness today. Let's keep the awesomeness focus on this granola. 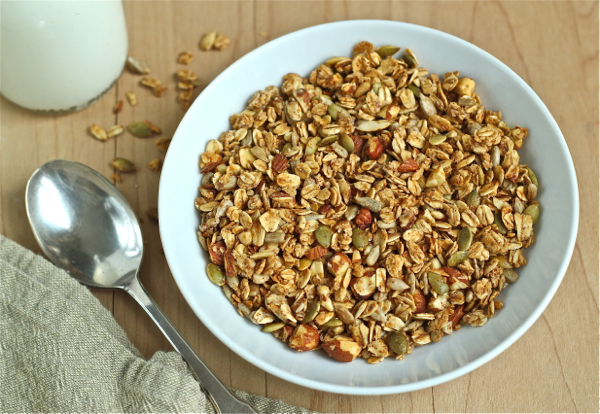 Do you make your own granola? What are the key ingredients that make it your favorite? Leave a comment: The Ninj wants to know. This recipe is easily halved but, trust me, you'll want to make the whole big batch. Combine the first 8 ingredients (oats through salt) in a large bowl. Gently heat the remaining ingredients in a small pan until just warm and combined. Add the warm mixture to the dry mixture and stir until everything is well coated. 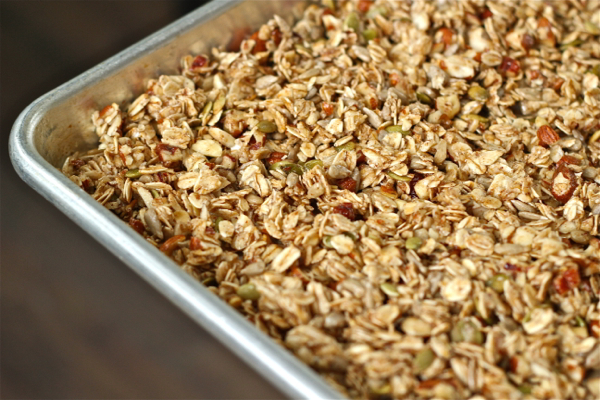 Spread the mixture evenly onto two baking sheets and bake for about 45 minutes, stirring every 10 minutes or so (to prevent sticking), until the granola is lightly golden. Cool completely on the pans and then store in an airtight glass container. If this is the one I had chez Ninja, I can attest that it's really fantastic. But what the heck are pepitas??? I guess I could look it up, but it's just easier to ask the Ninj. Pepitas are just pumpkin seeds -- they are flat and green and you can find them in the bulk food section of the grocery store. And yes, this is the granola you had -- glad you liked it!!! I love Cook's Illustrated's granola, and I love dried cherries, but this looks worth trying! Yum! Normally I like dried fruit in granola but this is just too perfect as is -- let me know if you try it!